Dr. Leaf is a Christian neuro-scientist and national speaker. 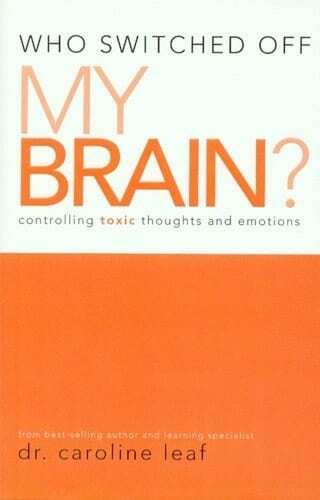 In her book, she explains, in medical terms, how the brain processes thoughts. She then overlays that with the Word to show us how magnificently God designed our brains and how through reading the Word, speaking the Word, and meditating on the Word our brains are physiologically transformed, healed, and enhanced in their ability to function. I now better understand how critically important it is to “renew my mind” according to what God says in His Word and why it benefits me to “bring every thought into captivity to Christ.” Toxic thinking is actually disobedience to God. Thank God that we can each exercise our choice to “put on the mind of Christ.” I highly recommend reading this book! If you go to iTunes, you can download Dr. Caroline Leaf’s talk titled, “The Male and Female Brain.” In this podcast, she shares many of the principles from her book, as well as additional information on how God designed our brains and how toxic thinking literally poisons our thoughts, minds, hearts, and bodies. The podcast lasts about an hour and a half. There are other Dr. Leaf seminars available there also.